RARELY PREDICTABLE, OFTEN SURPRISING, ALWAYS EXCITING. 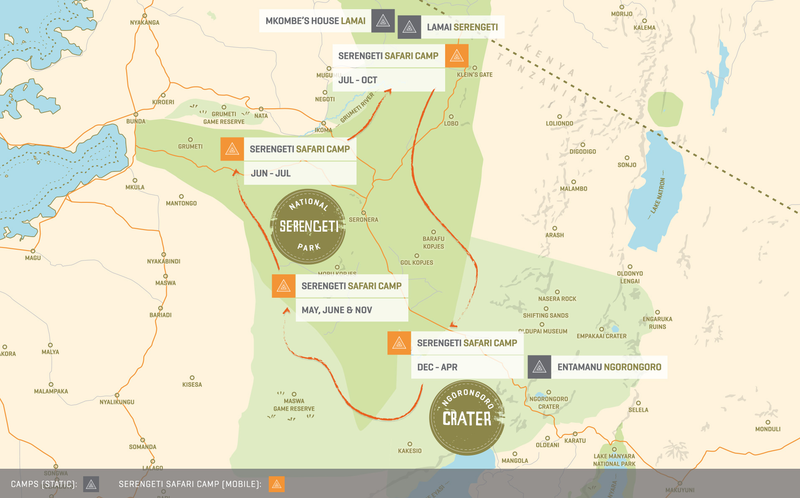 The Serengeti ecosystem is where Nomad was born as “Nomad Safari Guides”. Our founders started the first mobile safari camp of its kind. Since then our team of guides have accumulated over 200 years of experience between them. When it comes to the migration, you’re in the best possible hands. Our objective is always to have Serengeti Safari Camp in the best available position for the migration, these beasties may not always be where they're "supposed" to be. The maps below and the corresponding monthly guide aim to show you how the migration moves, and assist in your migration safari planning. More than 20 years of studying the migration and shadowing its movements has taught us that it rarely conforms to neat patterns and nice little maps…but in the interests of itinerary planning, here’s our guide to the greatest wildlife spectacle on earth. The southern plains of the Serengeti ecosystem are where the wildebeest would like to call home and it’s where life begins for half a million wildebeest during the calving which usually takes place in February/March. The herds linger on this nutrient-rich grass, stretching from the southern extreme of the Serengeti National Park (SNP) and into the Ndutu area of the Ngorongoro Conservation Area (NCAA). As the plains start to dry out and food resources are depleted, the herds venture gradually west and north as their epic journey begins. So starts a period of transition as the herds start to move north heading ultimately for the Mara River. 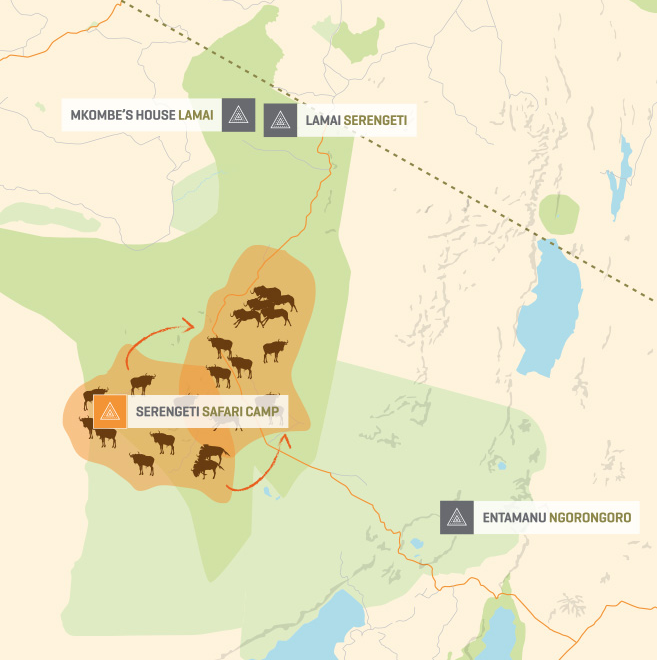 May usually sees the herds move into the Moru kopjes and central Seronera Valley areas of the Serengeti National Park, but depending on the rains, we may also see herds further south still, or approaching the western corridor. The transitional period continues, with June frequently being a superb time to see the migration in the western corridor, and here the herds face their first major obstacle in the form of the Grumeti River with its mighty crocodiles. Weather patterns at this time of year have a huge impact on migration movements and the herds can split up to follow different migration routes, double back on themselves to Seronera and Moru, spread out and generally provide a challenge for our guides. 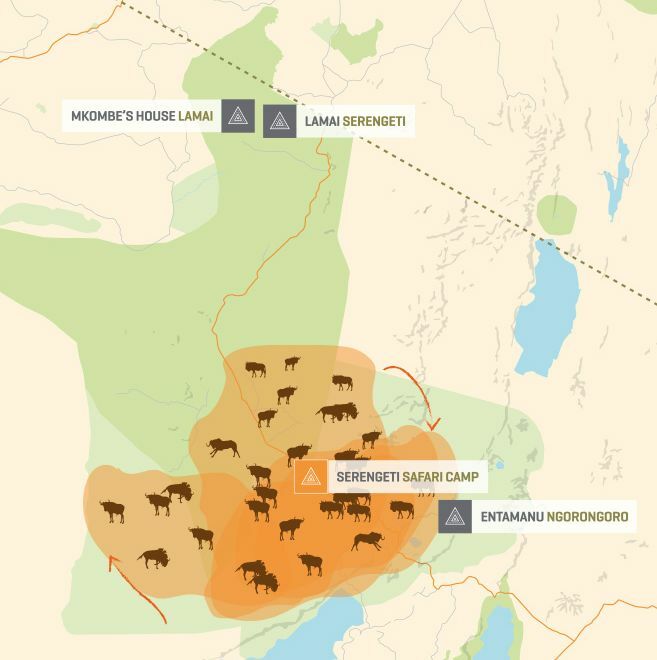 In very dry years, the approach to northern Serengeti can be accelerated with the first wildebeest arriving in northern Serengeti as early as late June. At this time of year we strongly recommend a combination of camps to secure the best migration viewing. The arrival of the migration to Northern Serengeti depends purely on weather conditions each year. When there is plenty of food and water the herds will take their time and spend longer in Western and Central Serengeti areas, arriving in the north as late as early August. 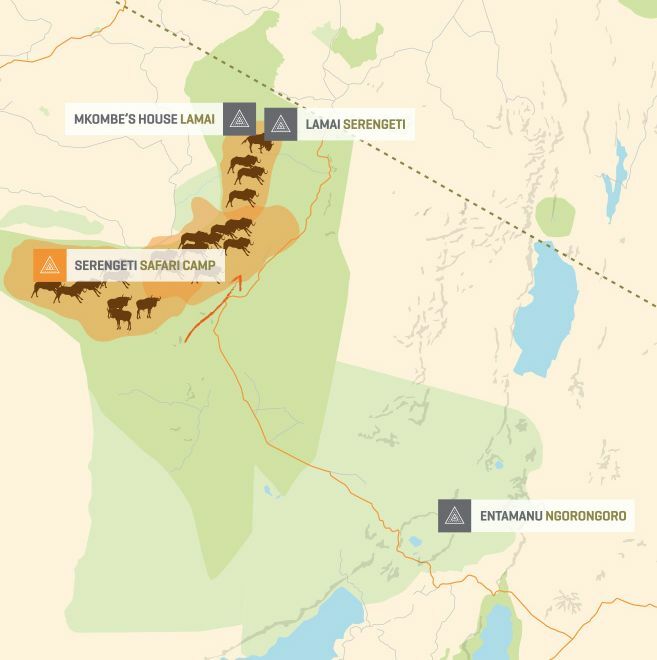 If conditions are dry, the first wildebeest will forge north towards the Mara river, a permanent water source, and a reliable supply of green grazing, and arrive as early as late June or early July. The Mara River crossings that take place over this period are the stuff of wildlife documentaries and make for dramatic viewing. They can happen at any point during this time of year, as herds criss-cross back and forth chasing the clouds; but they are elusive, rapid and unforgettable experiences. An experienced, patient guide is essential to give the best chance of catching a crossing. As the short rains fall, renewing more fertile grazing further south, so the herds begin to move south. November is another very unpredictable month when herds can be as far south as Ndutu or remain in the north for much of the month. 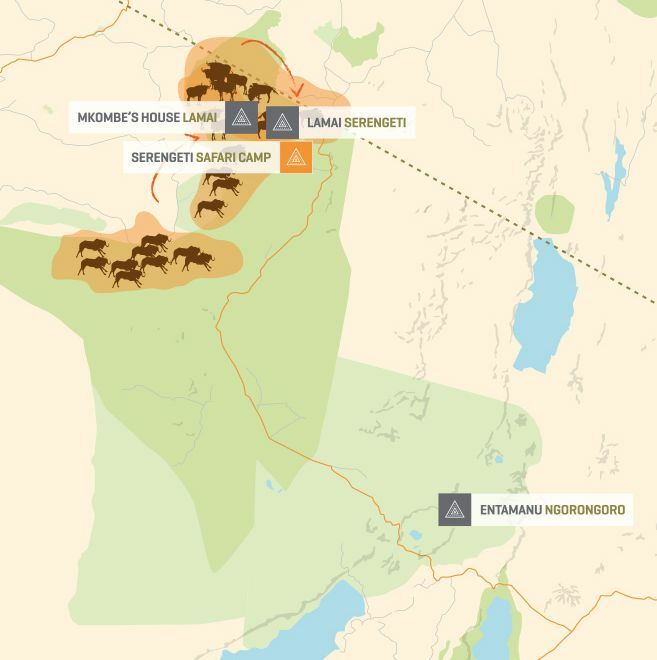 The herds will often split and take several different routes to the south and central Serengeti/Moru kopjes can be an excellent base to reach sizeable herds. Combining locations over this period is often a smart way to keep up with nature.